Although Angora goats do not visibly shed fiber, seasonal changes in fiber growth driven by photoperiod have been observed in Australia and New Zealand. Seasonal changes in mohair growth by US Angoras have not yet been characterized, which would be useful information for design of feeding strategies and as affecting mohair quality traits. 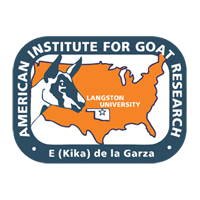 In this regard, fiber growth in Angora does of the E (Kika) de la Garza Institute for Goat Research was evaluated over a 1-year period, with the conclusion that a seasonal cycle of fiber growth in US Angora goats does exist. Primary follicle activity was lower in winter than summer, and clean fiber growth rate and fiber diameter were lowest in winter, greatest in summer, and intermediate in autumn and spring. Fleece fiber medullation was greatest among seasons in summer, and medullated fiber diameter was greater in spring and summer than in winter. These results should be useful to design optimal feeding programs for mohair production and shearing times for minimal medullated fiber contamination. For example, based on these findings the optimal time of shearing US Angoras for minimal contamination with medullated fibers may be just before spring and autumn equinoxes when it is likely that medullated fibers have been recently shed.